Sailing blog, sail the gulf coast, cuba, caribbean, rio dulce, venezuela, veracruz sailaway fun! : South Padre Island ship wreck, the S.S. Nicaragua, gun runner, gulf coast ship wrecks, treasure and gus? South Padre Island ship wreck, the S.S. Nicaragua, gun runner, gulf coast ship wrecks, treasure and gus? The S.S. Nicaragua sailed from her birth place in Bergen, Norway, into the history books of South Padre Island. She is a gulf coast ship wreck with a mystery to rival that of the treasure ships sunk in the Gulf of Mexico. Her trip between Port Arthur, Texas and Tamaulipas Mexico was to be her last. The secret to her mystery cargo may depend upon which direction and to which port she was headed. This was a lithe ship, 190 feet in length. 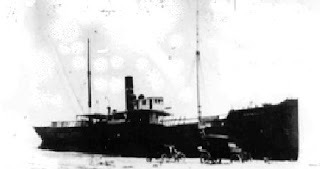 She was launched in 1891 and was the first ship into the new harbor at Beaumont Texas. At 190 feet overall she was not a monster for her times, but no lightweight, either. She had a slim silhouette and weighed 611 tons. She was white in color. "Many ships sent out may days"
On October 16th, 1912, a hurricane hit the Gulf of Mexico. Many ships sent out may days, many of the ships seeking help did not make it. The S.S. Nicaragua was one of them. According to Captain Echeverria, the S.S. Nicaragua’s commander, she was due east of So. Padre Island when the storm struck. Unfortunately, a strained rudder chain broke and the ship lost steerage. She was driven aground in the part of South Padre called the “Devil’s Elbow”. The dreaded Devil's Elbow is near milepost 50 from Malaquite Beach of the North Island. The convergence of the tides at this juncture left more than one crew ship wrecked. "Why was the ship so close to the South Padre shore?" Some wonder why the ship was so close to the So. Padre shore in the first place. There is speculation the ship was full of guns and arms destined for Pancho Villa’s army. Others say all she carried was cotton, still a cash crop for Texas at the time. If she was on her way from Port Arthur to Tamaulipas, the gun running theory makes sense. If she was bound for Port Arthur from Tamaulipas, her gun running legend falls flat for common sense. Who would send guns for the Pancho Villa army from Tamaulipas, Mexico to Port Arthur, Texas? Unbeknownst to the rescuers, Captain Eschevarria and the crew had survived the hurricane. After 5 days, the Captain divided his crew. He and nine others took one of the ship’s life boats and steered northward. The determined mariners fought the sea for five days. They were finally found by the U.S. Coast Guard near Port Aranasas. Captain Eschevarria had left 12 crewmen, possibly with instructions to head South on foot, also looking for a Texas port and help. "No sign of the missing crew was seen"
After being sent to search for the remains of the S.S. Nicaragua, officers on the Windham were notified Captain Eschevarria and some of his crew had been found. Lt. Carnes, in charge of the Windom, was asked to search for the rest of the survivors. Coast Guard cutter Windom However, no sign of the missing crew was seen. When the Windham returned to port it was assumed the rest of the crew had perished. To the surprise of all, on October 29th, six of the crew members made their way to the Port Isabel life boat station after a 54 mile trek along the shores of South Padre. It had been 12 days since the S.S. Nicaragua had gone ashore. A power boat was dispatched from the Port Aransas Coast Guard Station with Captain Ed White in command, and with Dr. J.A. Orr, to pick up the two injured crewmen. They found both men, a Spaniard and a Mexican and rescued them. Just a few miles out of Port Aransas the seas began to stiffen and soon all eleven men were tossed about by rough seas. The anchor was put down under Captain White’s instructions and five men took the lifeboat they were towing and went to shore to wait out the storm. Rough shelters made of driftwood were constructed to keep the men warm. Captain White remained with his boat. He and five of his men fought drenching waves and a bouncing sea for two days and nights. The breakers were huge and made life aboard the powerboat uncomfortable. It was impossible to cook so the men went without food and suffered cold days and nights waiting for the weather to clear. When the storm broke the men on the beach re-joined Captain White and his crew and they returned to Port Aransas. The life saving journey took for days at sea. “Her bow was headed northward, and from the storm-swept bridge deck you felt as though she had just plowed through the breakers, and was about to part the sea oats at high-tide mark and sail off into the shimmering mirages of the dancing and ever-shifting sand dunes. "A rope ladder still dangled over her side…"
“Her stern sloped off into the water, as her bow rose abruptly from the sandy beach. A rope ladder still dangled over her side…The deck cleaned and weathered by 10 years of sun, was tilted; and what was left of the superstructure gave you the impression of a ship starting a climb after wallowing through the trough of a wave. For many years the ship wreck, the S.S. Nicaragua, served as a navigation point for those traveling So. Padre Island’s shores. The stern, the engine room and the masthead of the vessel was visible just beyond the surf as one made their way up and down the coast. In 1933 the Texas Highway Department surveyed South Padre Island. When they came upon the wreck site there was little left to see of the shipwreck. They said only part of the hull had survived. Today, there is almost nothing left to mark the historic voyage of the S.S. Nicaragua, a steamer which set sail from Port Arthur to Tamaulipas Mexico, possibly with secret cargo destined for the Pancho Villa war effort aboard. The "system of cutters," the Revenue Marine, and the Revenue Cutter Service, as it was known variously throughout the nineteenth century, referred to its vessels as cutters. The term, English in origin, refers to a specific type of sailing vessel, namely, "a small, decked ship with one mast and bowsprit, with a gaff mainsail on a boom, a square yard and topsail, and two jibs or a jib and a staysail." (Peter Kemp, editor, The Oxford Companion to Ships & the Sea; London: Oxford University Press, 1976; pp. 221-222.) By general usage, however, that term came to define any vessel of Great Britain's Royal Customs Service. The U.S. Treasury Department adopted that term at the creation of its "system of cutters." Since that time, no matter what the vessel type, the Coast Guard and its illustrious predecessor have referred to their largest vessels as cutters. Today a cutter is any Coast Guard vessel over 65 feet in length. She was built by the Iowa Iron Works of Dubuque, IA, for $98,500. She was taken, partially finished, to Cairo, IL, and then on to New Orleans, LA where she was accepted by the Treasury Department. 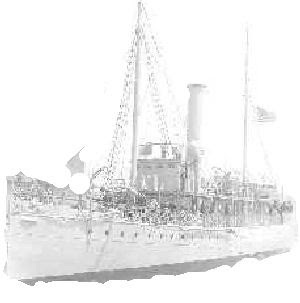 She then sailed to Baltimore where she was "finished by the Government" and entered service in 1896. 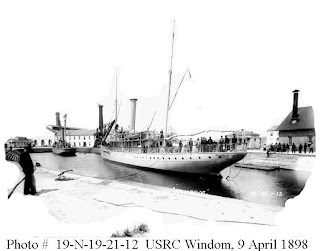 Windom served along the mid-Atlantic coast, saw service during the Spanish-American War in the waters off Cuba, and then transferred to Galveston, TX, in 1906. 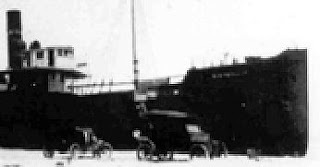 She enforced neutrality laws after the start of World War I, was renamed Comanche in December, 1915, underwent a year-long refit during 1916, and then was transferred to the Navy on 6 April 1917. She continued to patrol the waters of the Gulf of Mexico out of Key West and Galveston during the war and for the remainder of her Coast Guard service. She was decommissioned and sold to Weiss Motor Lines in Baltimore in 1930 for $4,501.